Please note that the villa is only rented as a complete unit. It has accommodation for up to 10 with an additional two or three in an adjoining luxury tent. Click here to see tent. Situated within a two and a half meter security wall on 25 acres of the finest land on the south coast of Kenya. Waterside villa comprises four very large bedroom/sitting rooms, with a total sleeping capacity of 10 persons. Two bedrooms even have their own private Jacuzzi . All are en-suite. Each bedroom has it's own mini kitchen with fridge and tea/coffee facilities. All four are situated around a beautiful designer swimming pool with split level waterfalls. The furniture is from the famous Funzi Furniture workshops in Tiwi and the house and the interiors have been designed personally by Sabine Funk of Funzi Designs. The property has an informal restaurant/bar with full size snooker table. The restaurant straddles two 350,000 litre fresh water lakes right on the sea. Both lakes are full of Tilapia. Private stabling for six horses are incorporated into the overall design and a par three golf hole for suitably qualified golfers. Provision is also made for helicopter landings. The property is heavily forested and much birdlife and wildlife are in residence. There are no dogs and no cats allowed on the grounds. Waterside villa is horseshoe shaped around a fabulous designer pool. each side of the horseshoe has two floors where the bedrooms are found. In the centre of the horseshoe is the central dining area with a massive handmade table from Funzi Furniture which can seat 12 people. The southern wing has the two largest bedrooms both with extra single beds. The one on the ground floor has it's own Jacuzzi. The upstairs bedroom on the southern side is over 90 square meters, also en-suite but with no Jacuzzi. 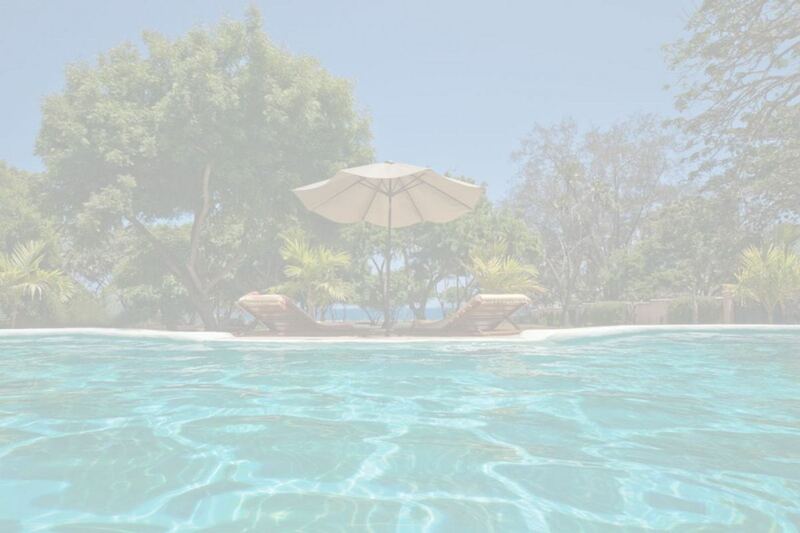 Waterside Villa is situated in Tiwi on a cliff top right on the Indian Ocean just 17 kilometers south of Mombasa in Kenya, and three kilometers off the main Kenya/Tanzania road. There are air links from the local Ukunda airstrip to all other major parks in Kenya. Mainly to the famed Maasai Mara, a mere one and a half hour flight. The kitchen at Waterside Villa is fully equipped and a cook and other household staff are included in the price. We are self catering but there is a large supermarket only 15 minutes away. Here you can buy almost anything you would expect to find in any well stocked European market. Fresh fruit and vegetables and fish is delivered daily to the door if necessary. In the immediate vicinity there are many scenic walks, and a few hundred meters along the reef at low tide are the magnificent Tiwi rock pools. It is also a beautiful walk along the reef and beach to the Tiwi river. Here you will find magnificent sunsets silhouetting the ancient Baobab trees near the old Congo mosque, a building dating back centuries. A nearby hotel in Tiwi offers windsurfing, diving, squash and tennis and a very modern gym. The nearest game park to Waterside is the Shimba Hills Reserve, just 20 min. drive away. The park is famed for it's elephants, cape buffalo and the rare sable antelope. Further a field but still only a few hours by car is the largest game reserve in the world, Tsavo National Park. Waterside are happy to cater for all your wedding needs. We can arrange a priest and all the necessary documents to make your wedding as easy as writing us a mail. We will arrange the catering and accommodation and help with any transport needs. Waterside can accommodate the main bridal family of up to 10 persons while our neighbors at Maweni Cottages can accommodate a further 100 guests. Balance payable 7 days prior to arrival. Bookings made within a month of arrival must be paid in full.